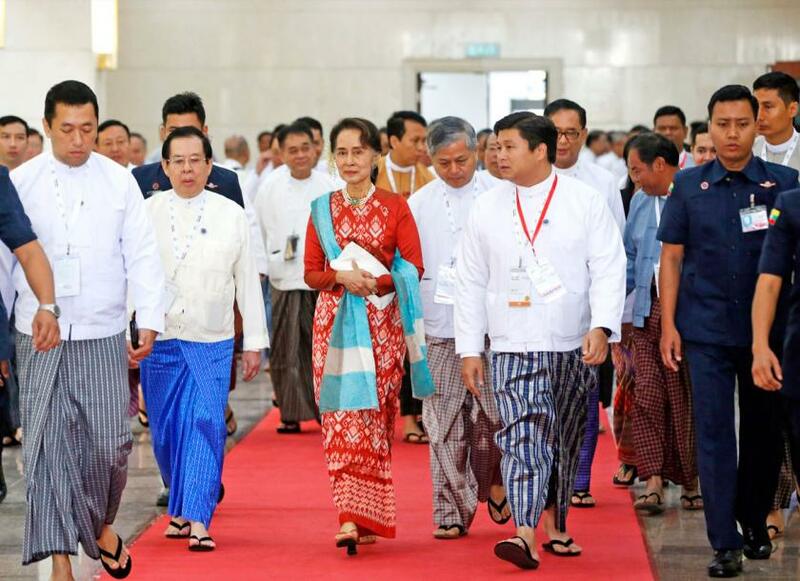 State Counsellor Daw Aung San Suu Kyi on Monday urged an audience of business bosses to invest in Myanmar in the wake of falling foreign direct investment and slowing growth, pledging to “build an investment-friendly environment”. She was speaking at the first official investment conference organised by her National League for Democracy-led government intended to win support for her handling of the economy. However, businesses were lukewarm about the speech, which did not touch upon the impact of political crises and offered few details on new reforms. Over the last year, Myanmar’s government has been under increasing pressure to bolster the economy and support the private sector. Approved FDI fell short of the official estimates by around 50 percent between April and October 2018, while a survey for European companies last month revealed that business confidence has fallen to a three-year low. This month, research firm Fitch Solutions downgraded its 2019 growth forecast for Myanmar to 6.3 percent from 6.6 pc previously. 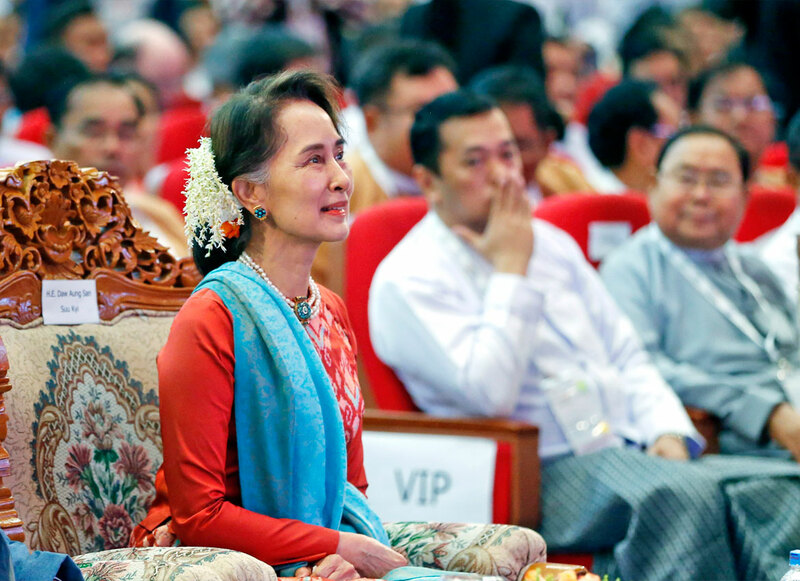 In her speech, Daw Aung San Suu Kyi touted Myanmar’s investment opportunities, its low labour costs, strategic location and potential in human capital. She also doubled down on the importance of Asia, in line with her administration’s pivot towards Asian investments and tourism. “Throughout the past 40 years, our region has experienced the greatest surge in economic growth the world has ever seen. “This rapid growth within ASEAN and the rest of Asia has spearheaded the creation of new trade relations, spurred the invention of new technologies, and facilitated the movement of people, ideas, goods, services, and capital,” the State Counsellor told a crowd of investors and diplomats. “Indeed, we live in an era in which Asia is rising… the global economic pendulum swings from west to east,” she went on. The leader highlighted her government’s major reforms since coming to office in 2016. These include the new investment and companies laws, liberalisation in retail and wholesaling and education sectors, restructuring of the Myanmar Investment Commission, the new electronic registry, creation of the Investment and Foreign Economic Relations Ministry, and the Myanmar Sustainable Development Plan (MSDP). Apart from the launch of a national “project bank”, Daw Suu’s speech was the same in substance as what she said at Singapore’s ASEAN Business and Investment Summit last November. She repeated her praise for Thilawa Special Economic Zone (SEZ), a project initiated by U Thein Sein, as “a crowning success”. Myanmar has been a major beneficiary of intra-regional FDI, experiencing a 45pc increase in FDI inflows from Asia, she added. “An example is the new manufacturing plant set up by Malaysia-based Kianjoo Group in Thilawa SEZ,” she said, referring to the can manufacturer which set up Kianjoo Can Myanmar (KJMM) and Boxpak Myanmar (BPMM) with investments of US$16 million and US$7.5 million respectively. The total investment is expected to amount to US$75 million for KJMM and US$38 million for BPMM. “We also hope that recent discussion between Thailand and Myanmar with the support of China and Japan will see similar [progress] in the Dawei SEZ,” she continued. The China-backed Kyaukphyu SEZ and port project, which her government recently signed a preliminary deal on, was not mentioned. “The greatest investment is in our people. They are the future of investment in this country,” Daw Suu concluded. Two business groups – the India Myanmar Chamber of Commerce and European Chamber of Commerce in Myanmar – called for better implementation and enforcement. Sunil Seth, president of the India Myanmar Chamber of Commerce, said it was “very encouraging” to have the country’s top leadership highlighting the investment potential. But he called on “all levels of government” to go beyond making pledges and put the message into practise. EuroCham Deputy Director Marc de la Fouchardiere praised the state counsellor’s emphasis on responsible investment and on the importance of education, construction and energy sectors, areas where European investments could play a significant role. But while European investors recognise the new laws and liberalisation measures she mentioned as “good reforms going in the right way”, there is little new in the speech. Daw Aung San Suu Kyi’s omission of the ongoing Rakhine crisis and the EU’s corresponding measure also did not go unnoticed. The humanitarian crisis has dampened market sentiment, and, with the EU considering withdrawing Myanmar’s tariff-free access to the EU market, may threaten the country’s nascent but growing exports. “Nothing new has been announced, and nothing was said on the conflicts in Rakhine State, among other matters, that do have a strong impact on FDIs,” de la Fouchardiere said. Others echoed a similar view. An American executive called the speech “old wine in new bottles”. “In spite of numerous pressing concerns, such as delayed legislative and regulatory reform, impending international economic penalties, and the general ineptitude of domestic players, the speech offered little of substance, and little more in terms of what is actually going to be done,” he said, on the condition of anonymity because he was not authorised to speak to the press. The executive stressed that “investment is not guaranteed, especially without specific reform that the state counsellor seems unaware of,” referring to implementation of new laws such as the 35pc foreign ownership allowed by the new Companies Law. Despite the criticisms, there are signs that Nay Pyi Taw is speeding up important reforms on multiple fronts, notably the anti-corruption drive, transfer of the General Administration Department to civilian control, changing the electricity tariffs and further liberalisation.